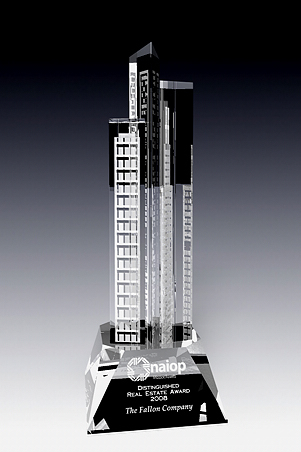 This one of a kind award is an artistic tribute to a contemporary metropolis. Modern day downtown symbolizes the epicenter of our business and social lives. This piece displays the many facets of the busy city with each reflection emerging in the hustle and bustle of the streets. Through the clever design the artist utilized prism qualities of the crystal towers and emphasized building reflections engraved on prism facets. The city award mesmerizes with its magic, dynamics and a myriad of dimensions. The city never looks the same- it changes it's appearance at each angle. This award is a perfect gift of excellence reserved for movers and shakers of each city. Personalization text and logos are engraved on the crystal base.